Heat oven to 450°F. Remove pie crust from pouch; place flat on ungreased cookie sheet. In medium bowl, mix 1/2 cup sugar, the cornstarch and cinnamon. Gently stir in apples. Spoon apple mixture onto center of crust, spreading to within 2 inches of edge. Fold crust edge over filling to form 2-inch border, pleating crust as necessary. Brush crust edge with water; sprinkle with 1 teaspoon sugar. Bake 15 minutes or until crust is golden brown. Sprinkle pecans over apple mixture. Bake 5 to 15 minutes longer or until apples are tender. Serve with whipped cream. The word crostata is Italian and describes a rustic, free-form dessert that typically consists of a layer of buttery dough filled with sweet fruit (and sometimes vegetables—crostatas can be savory, too). The pastry is folded about an inch over the sides, brushed with an egg wash or water and baked. No two crostatas look the same, and that’s part of their charm. You may be wondering: how is this different from a galette? The answer: crostatas and galettes are basically the same thing. Crostata is Italian, and galette is French, but they are both a rustic, free-form desserts with crust folded up around a filling. The filling options are almost endless for crostatas, but during the fall season you should look no further than this apple crostata. 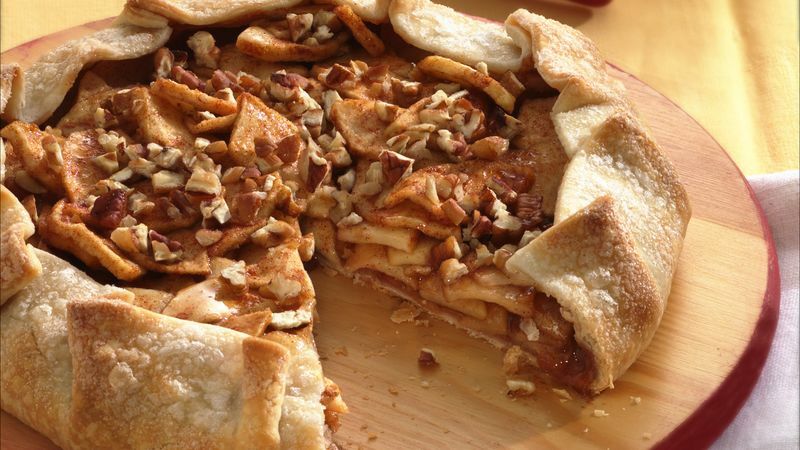 It has all of your favorite flavors of apple pie, but is way easier to make—no need to flute or fuss around with the look of the pie crust. If you do want to perfect your apple pie skills, we have an article for that, plus even more apple pie recipes for you to try next.